Motorola has released the Moto G at this dead cheap pricing and people are going gaga over the new device, but let us see if this device is really up to the mark to get so much attention and such craze. We will be telling you why this device is so cheap. What Motorola has done with the Moto G is being done by local cell phone companies like Xolo, Gionee, Micromax, Celkon from many years by giving great specifications at a dead cheap price range. But it never got this much attention. I must say that comparison of Moto G should be done with similarly priced Devices from Companies like Micromax, Gionee, Xolo to choose the best one of the lot. 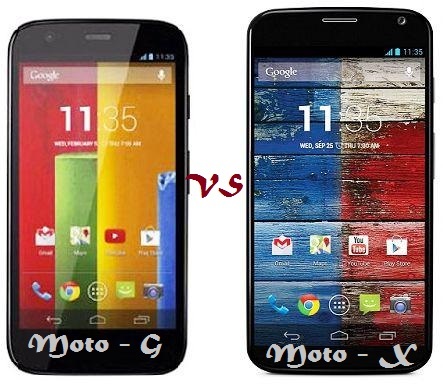 But here we are comparing the Moto G with its elder brother the Moto X which sort of created a market for this device. Size of Moto G: The size of Moto G is quite similar to its elder brother the Moto X except the fact that it is a wee bit thicker than Moto X. Display size is just a little on the smaller size with Moto G at 4.5 inches and Moto X at 4.7 inches. Screen Display, Type and Resolution: This is where we can see why there is such a price difference as the resolution is same in both the devices but the Display type is an Older LCD type in Moto G and the latest AMOLED in Moto X which gives the clarity of the device a major downgrade. The PPI density is rather better in Moto G compared to Moto X with G at 329 ppi and X at 316 ppi. Processor : The processor in Moto G is Qualcomm Snapdragon 400 where as in Moto X it is a Qualcomm Snapdragon S4 with Moto G having an impressive Quad Core with 1200 MHz and Moto G with Dual core but a higher 1700 MHz Krait processor. This does make a difference in but a good sign for moto g in this aspect. RAM: Here is another factor which makes the Moto G justify its pricing the RAM is Moto G is 1024 MB Ram or 1GB of Ram which i must say is on the lesser side but for the LCD screen that is at offer it is just fine to run the processes and Games which you would like to play. Moto X on the other hand has a 2GB ram which helps is cause to run the AMOLED screen better. Battery: The battery does way to the awesome specs at offer with such specification i was expecting a better bigger battery but with only a 2070 mAh battery you surely would have to be charging your device on a regular basis. Camera: If you are looking for a good Camera device than Moto G is not the place to look for with its 5 –MP rear camera and 1.3 mp front camera it is disappointing on the other hand the Moto X has 10 MP rear and 2 MP front camera at offer. So if you are good Camera user look away Moto G is not for you. The main differences which bring the price difference are the LCD display, 1GB RAM, 5 MP camera and the low Battery backup for the device which i must say are not that bad for a device which is priced at what is a very cheap and awesome deal for everyone who are looking for a device in below $200 or below 15k rupees price range. Go for the Moto G but don’t expect a Moto X type display and don’t think of becoming a photographer with this device in hand either. Have fun and do share if you like the comparison and review.